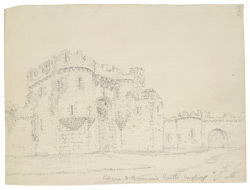 Edward I began work on his castle at Beaumaris in 1295. During that time, Llywelyn the Great had united Welsh princes of the area and was planning a rebellion against English rule and Edward needed to strengthen his authority. He captured the town of Llanfaes, changed its name to Beau Mareys ("fair marsh"), evicted all Welsh residents and set about enclosing his garrison town by defensive walls. The king employed the master castle-builder James of St George, who had built many castles both in Wales and on the Continent. The first line of defense was to be an 18 ft wide, water-filled moat, complete with a tidal dock for vessels to access the main gate directly. The central court measures three-quarters of an acre in area and is flanked by 16 towers and two gatehouses. The concentric layout is almost symmetrically perfect and the castle's potential impregnability makes it an awesome example of medieval military design. However, the castle was never completed. By 1298, the funds for building the castle had greatly diminished and Edward had pressing needs to finance other fortification projects in Scotland and Gascony.